Done, finished, completed..need I go on? 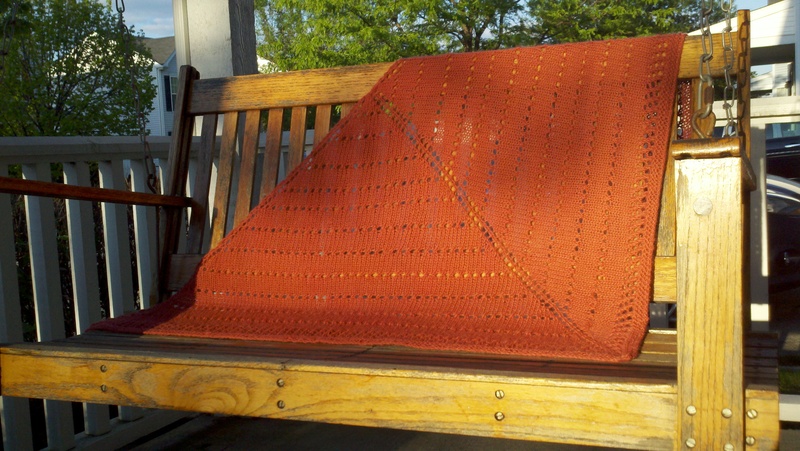 The dreaded shawl turned out great! Once I found a pattern that I really liked (“Sunny Days” in Knit Prayer Shawls by Leisure Arts), yarn I could work with (Brown Sheep) in my stash and got busy, it got done. Now for the hardest part. Finishing the finished product takes time. Weaving in the ends. *heavy sigh*. The detailed yoke was a snap. The feather and fan design worked out with minimal frogging. I admit counting isn’t my strong suit, especially when I am at work chatting. When I figured out that every fourth row was lace (duh) and the next three were purl, knit, purl that was only one row that had to be completed at home. So, if I that row at home, then the next three could be done on break and lunch hours at work. That increased my productivity the last few weeks tenfold! Then came the edging. After completing the five rows at the bottom of the shawl and binding off, the instructions said not to break off the yarn. The next step was to pick up stitches all along the side, then collar, then down the other side to the bottom. I tried to talk myself out of doing this. I could easily crochet an edging. 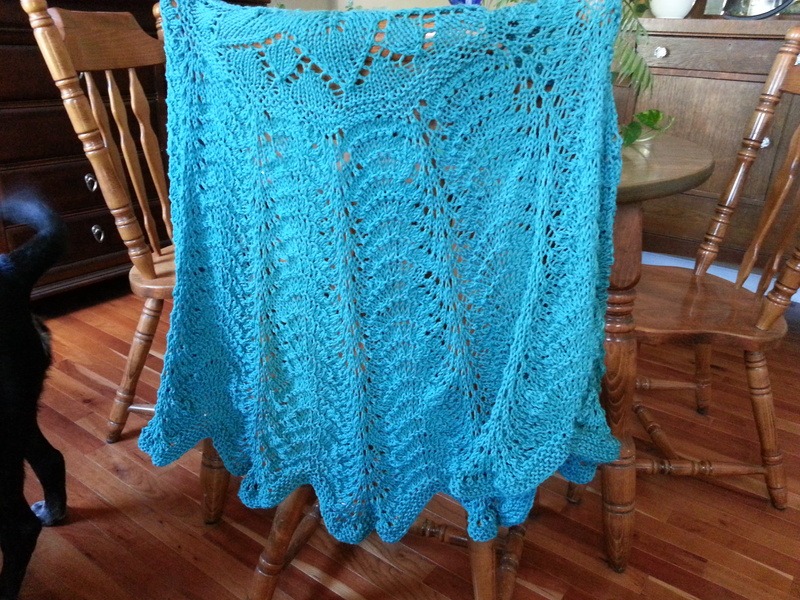 But the look I was after was an entire knit shawl, not a knit shawl with a crocheted edge. Honestly, it took way less time to pick up all of the stitches than I thought it would. I must pick them up weirdly though, because when I knit them, it is like they are twisted on the needle. I do this habitually, so it wasn’t that big of a deal that I slip each one off before I knit it slip back on the left-handed needle then knit as usual. Does anyone else do this? Should I leave it alone and knit it the way it has been picked up? Can someone tell me how to pick up stitches differently so I won’t have to slip them off and turn them around? I dunno. Getting back to the ordeal ahead of me – weaving in the ends – the best way I’ve found is the duplicate stitch method. You literally weave it back and forth either on the knit side or the purl side mimicking the stitches of your piece and you can’t see the ends. You have to leave a small tail on the wrong side so it doesn’t pop out, but when you block it, the wool tends to tighten up and hold it where you left it. There are videos, pictures and explanations, whatever kind of instruction you like is available. 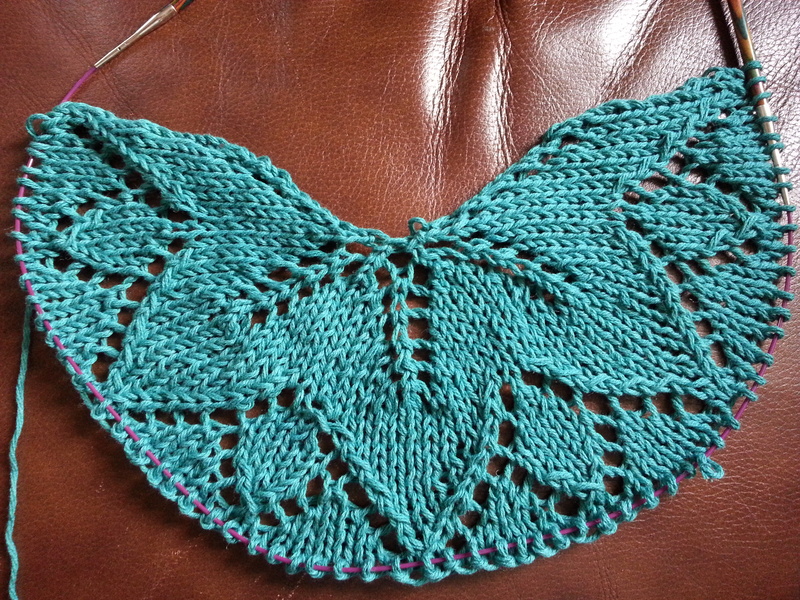 Since we are talking about finishing a knit piece, we may as well carry on to blocking. I used to think blocking was a waste of time. I’ll admit right now that was crazy. Not every piece of knitting and/or crocheting has to be blocked. Blankets, afghans, mittens, hats, some scarves… use your own discretion. But when making a lace piece, or a sweater, shawl or even a scarf that doesn’t showcase the stitches or is wonky, blocking is the way to go. It isn’t difficult, but does take a little time. I like the wet blocking. Use a nice wool soak according to the package directions. Carefully roll up your knitting in a thick absorbent towel and squeeze as much excess water out of it as possible. Then carefully use T-pins or blocking wires to shape your piece to the proper size on a board or mat. I like to use those foam interlocking mats that are about a foot square. They sell them on knitting sites, or you can pick up colorful interlocking mats at a craft store (I got mine at Michael’s) that are actually made for kids. You can make the base as small or as large as you need to. There are several methods. The one I like least is steam blocking. The idea is to use T-pins to hold your knitting in the correct shape/size and carefully hold the steam iron over it being careful not to touch it or you might flatten the stitches you are trying to define. You an also steam block by place a damp cloth (cotton is often used) on your knitting and carefully steam iron over the top of it.The key again is not pushing too hard or the stitches will be smooshed. 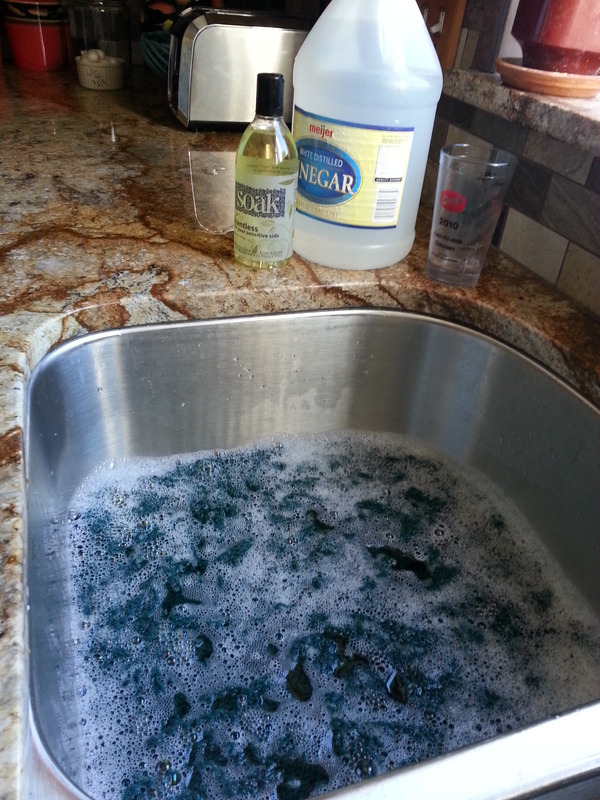 Lastly spritz blocking. It is wet blocking in reverse. 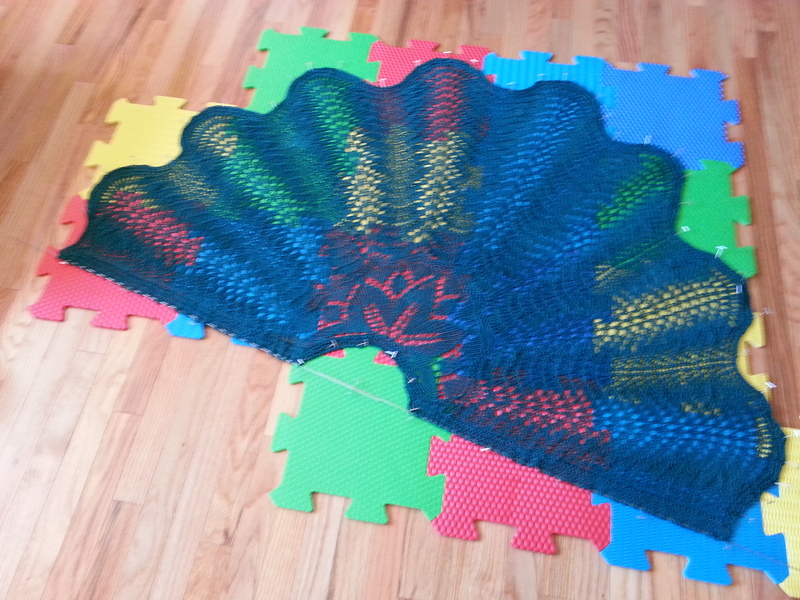 You pin the knit item to the blocking board, then spritz it with water until it is damp. I’ve used this method, it is ok for smaller items like scarves. But a larger item is easier to block using wet blocking. Stitch definition and edges look so much more professional after blocking, not to mention the drape of the fabric. It also makes it easier to sew the individually blocked pieces together. There a so many websites to choose from that tell you more than you’d ever want to know about blocking. One of my favorites is from Knitty.com. This link will give you tips on all types of fiber, not just wool. I have to increase stitches evenly the next row I knit. Uh oh, math. I know it should be pretty easy, but I want to make sure I have it right because I don’t want to mess up the pattern and have to start over. It would take me forever to look in my library for the exact formula, so internet here I come. There are many online sites that give instructions. I had my pick and I thought I’d share a couple of them with you. First things first – I only care about flat knitting increases for this project, so I won’t confuse anyone (ok me) by mixing in the directions for knitting in the round increases. You have to add 1 to the number of stitches you are going to increase. (I know, it doesn’t make much sense, but stick with me). To increase 10 stitches evenly over 100 stitches, you add 10 + 100 = 110 stitches. Now divide this total by the number of stitches you need to increase (11 – don’t forget that extra one) then divide the total number of stitches (110) by this number (11) – 110/11=10. The increase would be every 10th stitch. That was easy – but what if you have a fraction? (my mind begins to drift at the thought…) Ok, suppose you have 110 stitches and need to increase the same 10 (11 really because we’ve added the extra one – don’t fight it, I can’t explain it either) and you end up with 120/11 = 10.9. You still increase 1 stitch every 10 stitches 9 times and the llth stitch the last time. Now that you have used your calculator and possibly fingers and toes to do all of this headache inducing math – I found an even easier way. Go to this website http://www.thedietdiary.com/knittingfiend/tools/IncreaseEvenlySpace.html (save it to your favorites if you want, you may be using it often!) The Knitting Fiend Lucia has created a wonderful “plug and play” formula for all of us to use when increasing evenly. At the top of the page, you plug in the number of stitches in your row. In the next box, the number of stitches you need to add, then bingo! the number of total stitches shows up in the box below. Now scroll down a bit and the written instruction for the row is there for you to use. Thank you Lucia!!! Prayers and Hugs Jeanne for a quick and full recovery!! !